A docile man gets enraged when a politician's son throws acid on her face and later kills the miscreant. He is then hunted by the police and politicians who wants him dead. A Good Experience and perhaps the most accurate film ever on Bhagat Singh !! This is an absolute accurate movie , based on Bhagat Singh. Bobby Deol certainly has done justice to the role. Sunny Deol , though not better Aamir Khan or Akhilendra Mishra , yet has created a feeling that he is the man for the role of Chandra Shekhar Azad. Also as per the history , the hanging too was accurate as the scene , in reality , took place somewhat close to 8 'o' clock , and in the movie too, the scene takes place at the exact time . 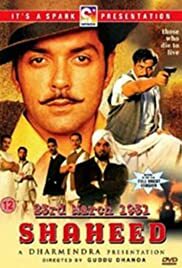 As for Bobby Deol , kudos for his superb action as Bhagat Singh , and hope that the great Bollywood wakes up from its deep slumber of ignoring perfect masterpieces.